Hey Guys! It’s 3 for 1 day, three projects in one post. 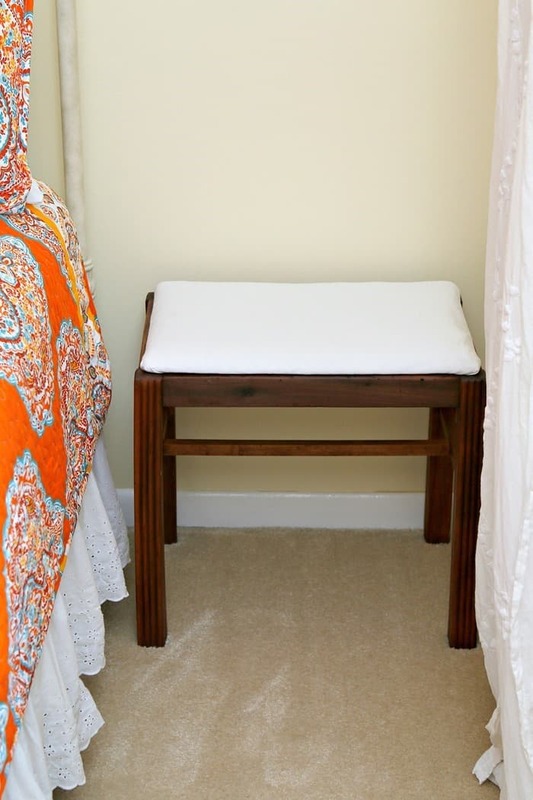 These 30 minute DIY projects are super easy. They involve the three things listed above although not all in the same project. I do a lot of projects that don’t make it to the blog. Every once in a while I pull a few of those projects out of the secret vault. Mostly when I haven’t been working hard and cranking out new projects…..like this past week. 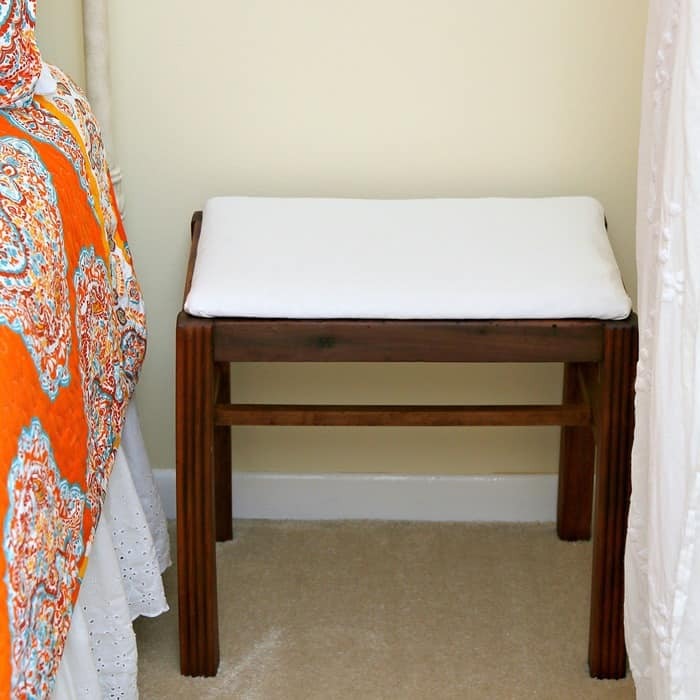 The first project today is a simple stool with a fabric seat. You guys who prefer that I not paint stuff will like this project. This is how the stool started out. I was going to paint it but changed my mind. The wood was in great shape and just needed some reviving. For a really simple look I selected a plain white sheet as the new seat cover. I cleaned the original seat with Simple Green which freshened it up some. The foam padding was still in good shape so no need to start over. Sometimes when we buy furniture at auction there are items in the drawers. Sometimes there are sheets……a bunch of sheets. I tear them up and use them as lint free rags and in this case as a seat cover. I cut two pieces of sheet the same size to make the new seat cover. 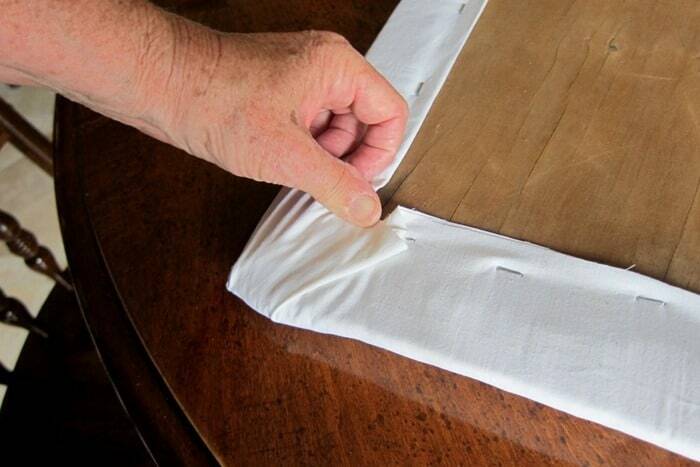 Since the sheet was thin, two layers worked best to cover the original fabric. I’m not going to give a detailed “How To Cover A Chair Seat” tutorial here. Just click that link if you need instructions. 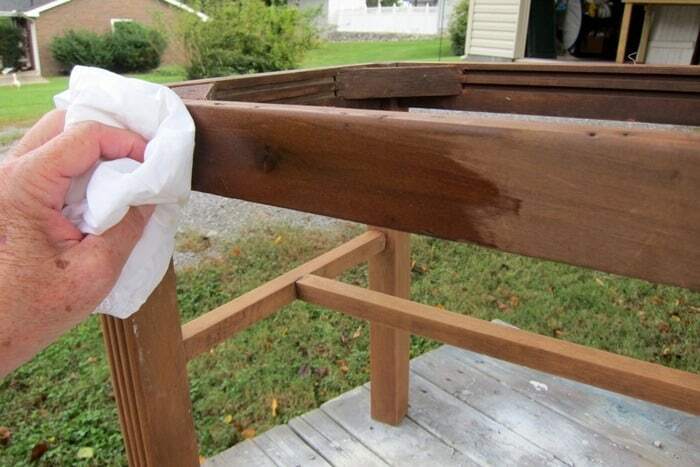 To freshen the wood I used Howard’s Feed n Wax applied with a lint free rag (sheet). See how the wax perks up the wood? A small chip brush is perfect for getting the wax into small crevices and corners. How neat is that seat? Simple and clean looking. Moving on to project 2. I’m not sure what kind of wood this is but I like it. 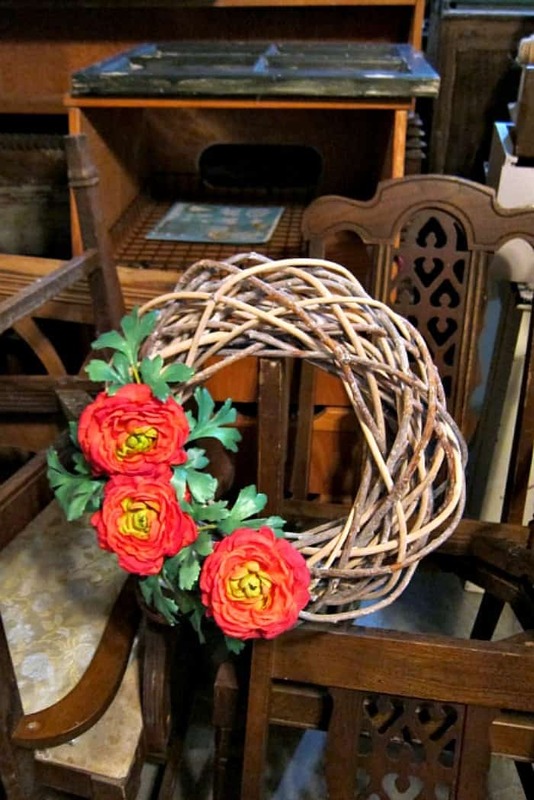 I found the wreath at the junk shop or the thrift store. Can’t remember which. I know where ever I got it…..it was cheap. I was sprucing up my booth at the shop last week and brought a bundle of these flowers home. They were in the booth for a while and didn’t sell so time to come home. 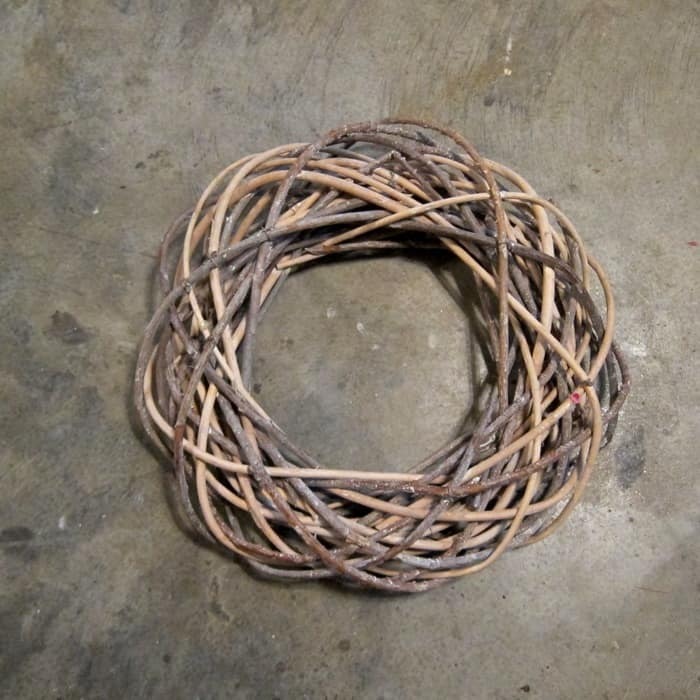 When trying to organize things in the workshop a few days ago the two things came together. 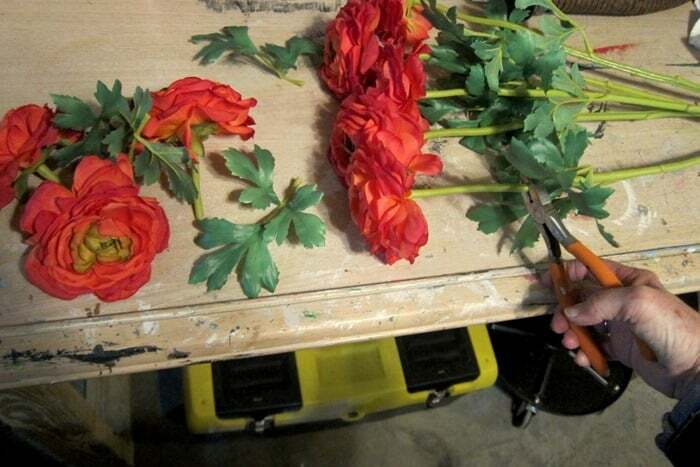 I used a pair of wire cutters to snip the stems on the flowers. I then hot glued 3 flower blooms and a bunch of leaves to the wreath. Ta-Dah! Pretty wreath for Fall. I love orange. If you look at the top part of the wreath photo you will see a reclaimed window laying on top of a cabinet. I spotted it when taking the photo. I think the wreath and the window are going to come together soon. I’ll post a photo if I put them together. That’s the way it works in the Owen workshop. A lot of times things come together by accident. Maybe because I have a lot of junk in the workshop to choose from. Moving on to project number 3. 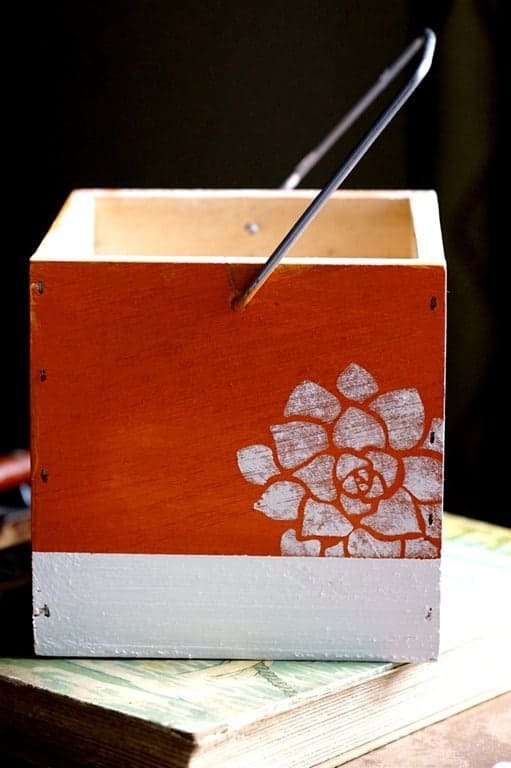 I painted, stenciled, and layered the wood caddy with paint. Did I mention I love orange. Fall is my season. The caddy makes a great treat box or maybe a planter or maybe a utensil holder or maybe something else. Each side of the caddy is painted and stenciled in a different way. I did a complete Facebook Live tutorial on this project. The neat thing I show you is how to use the layering block. 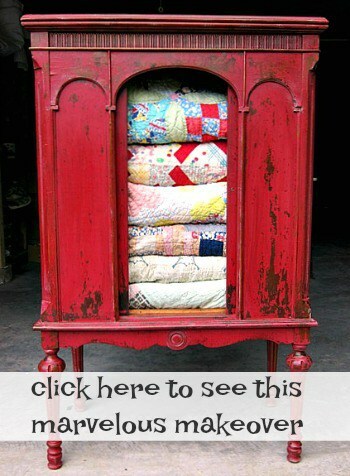 The layering block is the perfect tool to give furniture or any kind of home decor a faux distressed look. 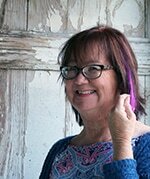 Find the FolkArt Layering Block and other Petticoat Junktion favorites on my Amazon Page here. I like the wreath, Kathy. I’d like to find one like it. You don’t see that type too often it seems like. The flowers on it are a just-right addition. They add interest but don’t over-shadow the pretty wood of the wreath. The other day at a local thrift store I found a cute wooden tote but it is painted yellow with some flowers painted on each side. I want to make it over so I’m trying to envision it painted another color and perhaps decorated with some sort of stenciling. I don’t want any sort of holiday theme, but maybe a garden or plant decor or a French script. Any ideas? This will be one of my first up-cycling projects. I like the way you treated the wood on the little stool to bring out it’s beauty. The sheet treatment for the seat, not so much. I think it really needs something to give it some color. I don’t mean bright hues but something a little closer to the tone of the wood. I can see a muslin or feed sack or other material with an off-white or cream background. To me the white sheeting is too stark next to the wood tones. But, just my opinion–not meant as criticism. We all see things differently. Thanks for the varied and fun post! Love your post. I just got a little box with handles and you always inspire. Thanks. I love old windows but every time (so far) I see one, they are too expensive for me. Maybe one day I’ll find one at a price I like. Thanks Kathy. I found this practical demonstration so interesting and helpful and I can’t wait to try the lettering block technique in particular. This seems excellent for allowing you to get a subtle effect and it’s so easy and quick even for someone as unskilled as I am. Thank you very much for this, Kathy. It is very easy Bobby. Give it a try! Love the three projects!! 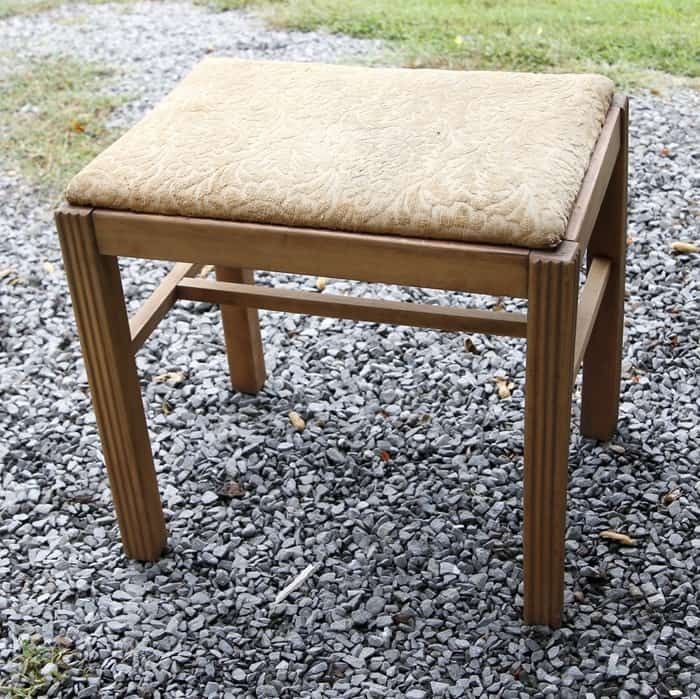 I really like that you recovered the stool and conditioned the wood and did not paint it. Nice job! I could not find a link for how to use a layering block. Help!! I love your little wreath – and I love orange also. Love your bedspread in the room with the newly covered seat bench. You really cleaned up that wood well, Kathy. 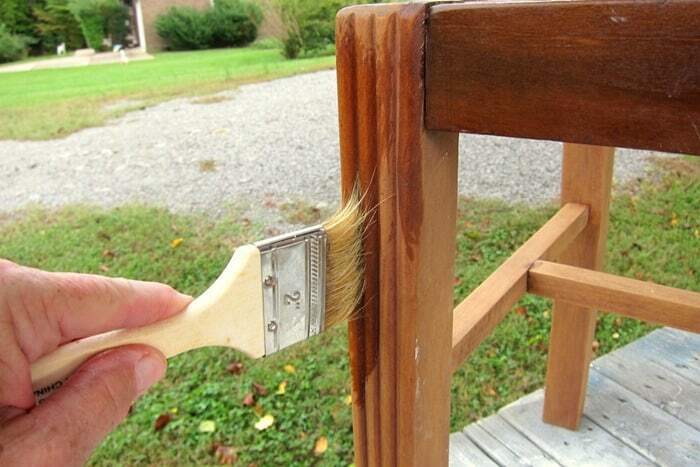 It looks great and sometimes wood should not be painted. I like old windows, too, so looking forward to you finishing that window/wreath project!